One of the phrases that will send most healthcare for the homeless providers into a hair-on-fire-tizzy is when a justification for allowing the continuation of homelessness in our cities is based on the concept that the homeless just don’t want the help. I can understand how this line of thinking evolves. It has been said that the United States is the richest country in the world with the most resources to help its citizens. How, then, can we explain that people are still refractory to this wealth of money and resources. The rationalization, for both society and the individual, becomes to accept that some people just don’t want the help. It is easier for us to go about our morning commute, our jog through town or our walk into work if we work it out this way in our minds. A few months ago, I read a book by St. Francis DeSales entitled Finding God’s Will for You. St. Francis DeSales was known for his belief that ordinary people could live holy lives in their communities and did not need to be cloistered (as in a nun) or in a monastery, cut off from the rest of the world and it’s many challenges and temptations in order to live holy lives. In this book, he talks about God’s will being the sun and ourselves or our willingness to accept his will for us as a mirror. At times, the mirror is small and only reflects a small amount of light. It does not mean that the sun is small but rather it is our mirror that is small. As we grow in acceptance of God’s will, our mirror grows and is able to accept and reflect more of the sun’s light until we are fully aligned with and accepting of God’s will. I think of our friends on the street and their willingness to accept help in the same way. When we first meet them, the mirror is small. It may even be impossible to appreciate, made small by pain, suffering, hopelessness and rejection. Feeling unloved and incapable of being loved or loving another. Many times, I have been startled at the depth of shame carried around by our fellow brothers and sisters. But over time, the mirror grows as trust is built so that one day, a full reflection is possible. An acceptance of help, hope and possibility comes into view and value is restored. We are often impatient with this process, wanting results and success to satisfy our own needs and desires for affirmation. Building a relationship can literally take years. I once watched a brilliant lecture by a colleague from Southampton, England who called it the One-Less-F***-Off. He described a patient who, upon eye contact would yell the magical phrase that sends most people away. No matter what he said, “F*** off” was the response. Over years, the number for f*** off’s received diminished so that once, when our colleague didn’t visit him but rather visited a nearby street friend, the patient proclaimed “Hey, where the f*** have you been”. Success defined by the most peculiar matrix. But success none-the-less. At the June 2017 National Health Care for the Homeless Council Conference, Jim O’Connell of the Boston Healthcare for the Homeless Program responded to an audience question with a reminder that we cannot erase the trauma that has happened to our patients prior to meeting them. The growth of the person is not about us, the provider, but rather about the return of this precious individual to their rightful value as they gaze upon and accept their own reflection. In September 2016, Brett and I traveled to Rome for the canonization of Mother Teresa into sainthood. In an effort to save money, we booked a local flat through AirBNB and lodged just two blocks from the Vatican. On our way back one evening, we crossed St. Peter’s square and, after passing two armed guards stationed at a government building, made a turn onto a side street close to home. 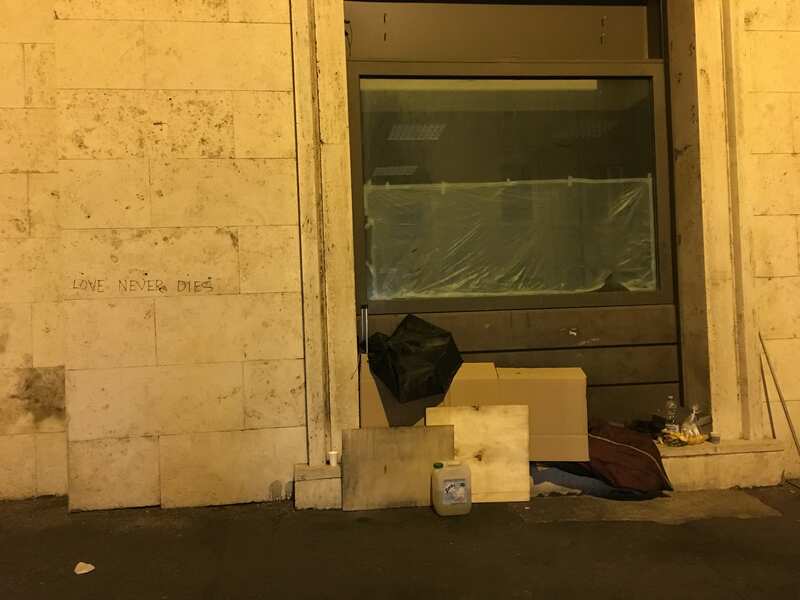 The area near the Vatican has become a safe space for the homeless to sleep at night without harassment from the police. 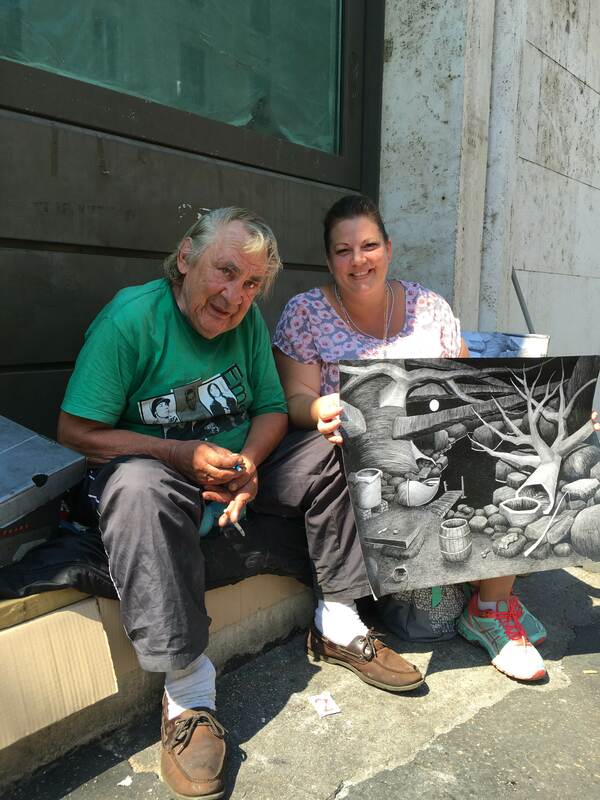 The local homeless service providers who generously shared their time, experiences and solutions with us tell us that this is a result of Pope Francis declaring that these souls should be left alone and allowed to rest without disruption. And so, to some local surprise, the local police have backed off and allow for some peace and quiet. As such, it was no surprise to see a doorway inhabited by an elaborate cardboard-bag-bottle structure skillfully designed to block light, noise and provide an astonishing amount of concealment for the person who was likely residing somewhere inside the materials. What caught our eye, however, was an inscription scrawled on the marble slab to the left of this construction – LOVE NEVER DIES. We stopped and took a picture of this remarkable image wondering who wrote the message and if the inhabitant of this doorway agreed or disagreed with the statement. We continued onto our flat and retired for the evening. Each night, we saw the same cardboard-bag-bottle construction with the same refreshed inscription, and each night we wondered. Three days later, we were walking back from the canonization mass. Anxious to rehydrate (it was about 92 degrees fahrenheit), use a bathroom (400am -2pm is quite a long time!) and to escape humanity for a minute (a sea of 500,000 humans is enough to make anyone need a quiet (padded) room), we nearly missed him. Our doorway dweller was awake, sitting up below the inscription and working on an elaborate drawing. Bathrooms, water and silence would have to wait. We made our way through the crowd and introduced ourselves. George, a man in his 60’s, had primarily inhabited this doorway for the last 6 years. A fisherman from Sweden, he had somehow been land ridden for some ambiguous reason. His drawings were remarkable. He had two completed charcoal drawings and was half finished with another one. All of the completed pictures contained a series of objects that were rearranged or drawn from a different angle. We explained street medicine to George and he engaged us in an interesting conversation about his experiences, affirmed that he had a doctor (however we discovered an access problem- his doctor was in Sweden), and how the heat of this summer had been particularly difficult for him. But it was his explanation of his drawings that moved me the most. The wooden truck was his favorite toy as a little boy, the canoe was his first fishing boat. A child sized fishing rod and small scaling knife were important pieces of his happy place. A pot for smoking fish lead me into a detailed conversation about how to properly prepare and cook fresh fish (fascinating for me considering I generally avoid eating things that originate from under the water). He said he draws to keep himself out of trouble. But I saw something much different. His drawings simply represented the happiest time of his life. A time when he was a young boy, falling in love with fishing and providing for himself. Before he spent 45 years at sea, had broken relationships with his family and had ended up, well, here. We purchased one of George’s drawings which hangs in a place of honor for him in our home. While he never explained why he writes his message next to his doorway everyday, he really didn’t need to. He retains a sense of hope that one day the tides will shift and he will find his way home again, perhaps to the place in the picture. He agreed to take a picture with us (which you can see below) and thanked us for keeping him company. As we walked away, George asked us to promise not to forget him. Promise made. Promise kept. Four years ago, we attended our first International Street Medicine Symposium in Boston (MA). I was wide eyed, excited and in hindsight- mostly clueless about the real world of street medicine. Street medicine in the Lehigh Valley did not exist yet, I had never been on street rounds and had only read about such legends in this area of medincine such as Dr. Jim Withers and Dr. Jim O’Connell. I met like minded people and heard tales of incredible collaboration between civil services, shelters, providers and consumers. I saw demonstrations of how humility combined with leadership can change an entire city and its citizens. And I do mean all of them – the housed and unhoused, the voting and non-voting, the overachieving students and the retired sunset-riders who directly or indirectly reaped the benefit of the Boston Healthcare for the Homeless Program (BHCHP). In the subsequent years, we travelled to Dublin, Ireland then San Jose, California and most recently- Geneva, Switzerland. Each conference provided new insights, new data, new frameworks, new friendships. As Dr. Pat Perri, chair of the Street Medicine Institute said at the most recent conference in Geneva- it is like meeting aliens from the same planet. As I sit on my flight returning from Geneva, I am struck by the lecture I had the privilege of hearing yesterday by Nick Maguire (Southampton, UK). He is a psychologist with a brilliant mind and a wicked English sense of humor who has a way of making sense of the behavior chaos that we observe on a regular basis on the streets and in the shelters. His points were so profound to me that I have hardly been able to think of much else. But as he started his lecture, he told us how much this conference means to him. As he says, it is a bucket filler when the world is so often full of bucket emptiers. We come to this conference and are renewed with our sense of purpose and inspired by the brilliant minds from all across the globe that have so committed themselves to such a worthy cause. People who have left lucrative positions in pursuit of a meaningful contribution. People who risk arrest by providing medical care on the street. People who accept that possibility that everyone you know professionally and personally might think that you are crazy for doing this type of work. As Nick was speaking, I glanced over my right shoulder and saw Jim Withers sitting toward the back of the room as he so often does and thought about how it feels to know that your vision is being shared and LIVED by so many people. Inspiration can be a fickle thing- there one day, and then gone the next. Sometimes people act on their inspiration but, action can also be fleeting. It is inspiration that makes us come back from church camp when we were kids and throw away all of our excess toys, cd’s (back when we used such antiquated objects to listen to music) and other items we deemed unnecessary once we realized that living a simpler life for a week wasn’t so bad after all. But three months later, there we are in our rooms with piles of newly accumulated junk that we forgot we had decided we could live without. Fleeting. But to inspire and then foster inspiration that changes the trajectory of how people LIVE is something quite different. And for me, the International Street Medicine Symposium is like inspiration on Arnold Schwartzeneger dosed steroids. Thanks Street Medicine Institute. Bucket filled. Lid applied. Pressing on. Portland, Oregon was the host of the 2016 National Healthcare for the Homeless Conference and Policy symposium. I found it to be a fascinating mix of liberal residual hippee mentalities mixed among upscale microbreweries. A blue city residing in a largely rural red state. The first thing that struck me about Portland was how clean the city was. It’s beautiful to look at with its detailed architecture, Mount Hood peering over you in the background and the Willamette River hugging some of the neatest reformed parts of town. Freshly potted plants sprinkle the windowsills and front door steps of many residential and commercial properties. One afternoon I watched teams of volunteers artistically arrange flowers and potted plants in fancy designs in a local square just for the viewing pleasure of the many young professionals who eat their lunches on the squares surrounding steps. In general there was a sense of calm in the city. But there was one obvious difference that somewhat shatters the beautiful façade of Portland. Every 6 to 10 feet I encountered a person experiencing homelessness. A man, a woman, a child just sitting on the street. Some of them were clearly high, but many of them were not. One woman sat with a pad of paper and pencil in her hand but was stuck in a catatonic state of waiting for inspiration. Some of them were panhandling, many of them were not. Children were coloring while their parents made signs displaying their person plight. Many people were laying with their pets. The thing that struck me every day was that for the size of Portland, the number of homeless is unbelievable. Most numbers estimate between 3400-3600 people sleep on the streets of Portland every night. The lack of affordable housing and the lack of enough shelter caused the governor of Oregon to declare a state of emergency which allows homeless to sleep on the street safely without being disrupted by police, business owners or residents. The city has seemed tolerant of this and understanding of the fact that there is simply no where to shelter all of these people. It does beg the bigger question though. Why are there so many? It seems that no part of the city with has been spared by number of visibly a visible homeless. During our travels, we took an informal poll. People working at donut shops. our taxicabs driver, local lifetime residents etc. We simply asked “Why do you think there are so many homeless in Portland?” Interestingly they all gave the same answer. They thought that because Portland was such an understanding and homeless friendly community, the people (particularly youth) were seeking out Portland as a counterculture experience. There is a pervasive feeling that these that the majority of the homeless in Portland wanted to be homeless for the experience. While many of those that we informally polled recognize that the legalization of recreational marijuana probably his added to the appeal of coming to Portland, none of them could say for certain the size of that effect. The locals seem particularly bothered that there were so many people with seemingly no end in sight. While they admitted that they felt ‘bad for the people’, they were relatively unsympathetic because they felt that this was a situation that has occurred by personal choice. When I attended a breakout session with people representing homelessness from all over the state of Oregon, I told them what the locals told us about the homeless problem in Portland. I asked if they felt that it was true; that there was a counterculture experience occurring and Portland happen to be the perfect place for it to occur. All of those representing Portland on the panel adamantly denied that any of what the common feeling was true. One CEO of a local if you federally qualified health center commented that while the summers are mild, the winters are very cold and rainy and no one would choose to be homeless and stay in Portland. I would say the same for people who are homeless in New England, in Pennsylvania, in Michigan. Many people endure these harsh winters and yet they don’t leave (which has puzzled me for years). There’s no migratory patterns for the homeless to fly south for the winter. While the truth likely lies somewhere in the middle of these two polarized viewpoints, this creates a particularly large problem for philanthropy. People do not donate to a cause in which they feel the misery of poverty is by choice. Frankly, the sympathy factor goes way down and when there’s no sympathy there’s no money. Perhaps some of the most important (and challenging) steps that Portland must take is changing public perception. Porland seems prime for the picking to lead the country in inovative solutions to minimize homelessness. A combination of finances, a youthful open minded population with well-established social and healthcare services. I look forward to watching this city’s story unfold. Press on Portland, press on. Nursing Notes: How Come You Never Asked? I smiled at him. I said because your religion isn’t a factor for me, no one’s deserves to be homeless, especially homeless and blind. Our journey together is not going to be an easy one, we are making small steps every week. 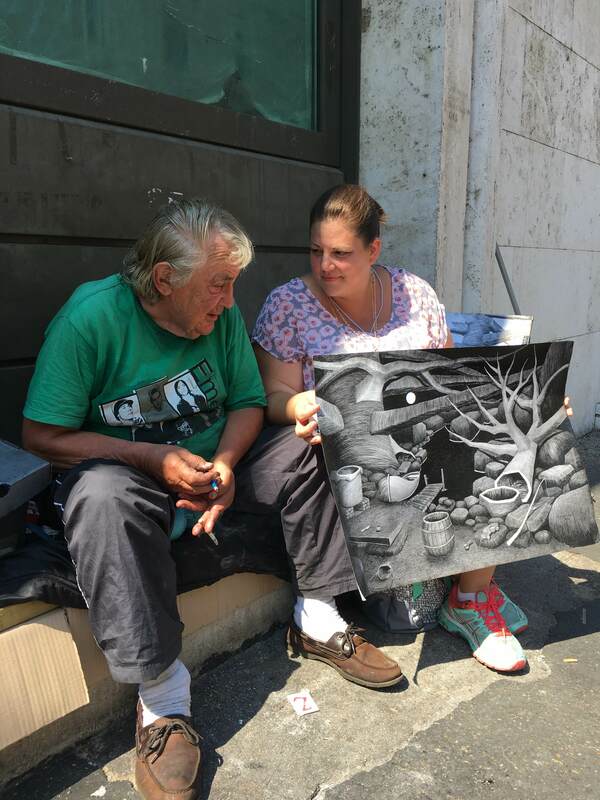 Until you have become homeless or ever tried to assist the homeless you will never truly appreciate simple things such as making an appointment with a specialist, getting a pair of glasses, getting unemployment, applying for an apartment….for these people it takes months to obtain any of this. The average individual simply makes a phone call…applies online…gets the information mailed to their house…where does a homeless individual get their mail? What phone number will be called? Who has an email address?